What we offer is very different than your standard. With all our clients WE PAY for all necessary training that is required by law by the HSE for your building, this can be a very large expense that is traditionally met by the client, but we cover this for you FREE* (based on contract). 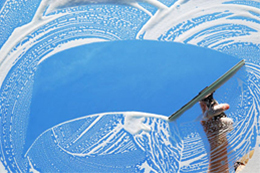 Our FREE tried & tested *Dry Drop procedure DDP (RAMS provided) This enables us to quickly and very accurately estimate how long the cleaning procedure will take for your building; this gives us the competitive edge with regards to pricing- we do frequently cut window cleaning bills by up to 50%. *DDP- With total consideration to the building, the building occupants & the public using Anemometers, dead weights, weather checks & communication radios our fully experienced cradle operators will lower the cradle to the base of the building and return the SAE to its housing. ..its total piece of mind..
Leaving you completely satisfied that you have a very experienced & competent company on your roof going over the edge. Just check out our Health & Safety Accreditations. 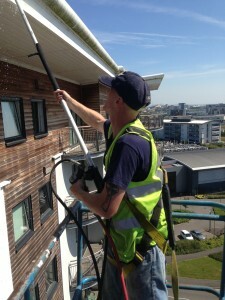 Cardiff Commercial Window Cleaners ltd offer abseiling service to compliment the various other methods of high level cleaning. This enables us to access areas where all other methods are not viable. 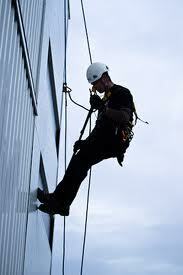 All abseil technicians are highly experienced and fully trained to the highest IRATA standards in rope access. 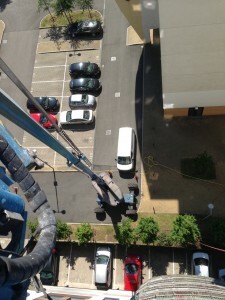 Using rope access can be cost effective solution to any high rise building. Mobile Elevated Working Platforms (MEWPS) Cherry Pickers & Scissors. 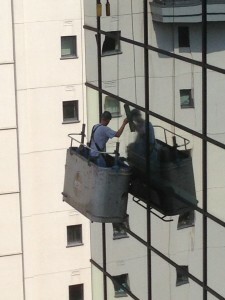 Not all buildings can be cleaned or accessed by conventional methods or reach & wash.
CCWC Ltd have access to a huge range of Hydraulic Platforms, Scissor lifts, Cherry Pickers and specialised equipment known as Spiders ideal for those courtyards atriums etc.. All MEWPS are powered by electric or diesel reaching heights of between 10 and 40 meters. When truck mounted they can reach in excess of 60 meters. All machines are operated by our fully insured & trained IPAF Licence holding staff. As you can see from the picture, we are about to mount the block paviour pavement using this 20 tonne machine this is where the banksman lays protective thick ply-board in front of the MEWP to spread the weight and protecting the blocks underneath.